About when and why Karma Music was started. After the explosion of art, music, creativity and rebellion came the antiklimax: late 70'es the record industry closed in on itself . Newspapers, television, radio and international labels together, were totally autocratic and controlled the supply, demand and prices. The Bogcafe's closed and the major record companies went together on a common distribution system which excluded all small entities . Hippie Time stood for diversity and anttikommercialisme, but no one protested . Flowerpower time had passed. Mainstream media , power, and manipulation got a new and frightening meaning. Karma Music was founded in 1976, partly in protest against the development. Karma worked both as a recording studio, record label and publishing company. We produced casettetapes , records, books and Tarot cards . And posters, too, in serigraph, - and we put them up everywhere in Copenhagen. At night, our posters were plastered completely - large posters with Tina Turner . But we came back and the great company, that plastered our posters, was beaten and began to stay away from our sites. From time to time we went to the Ministry of Culture and painted " FIMS " at their door. It was a "culture war", but in a different context than the "culture war" the so-called liberals stood for and which you can read about in the school newspaper information . Karma Music started in 1976. At that time the studio consisted of 2 Tapedecks, 2 microphones, an old HH 5 - channel song amplifier / mixer with reverb, a guitar construction and various instruments. This gear was set up in a backyard at Gasværksvej in Copenhagen. (We lived at "Dyssen" at Christiania, but there was no electricity). And here we made the first tape "Snydt". It was casette tapes and they were sold for 25 kr. We made 400 pieces in the first edition. Later followed other experimental editions like "The Kiss og Space" with texts made of, among others, Andre Breton. 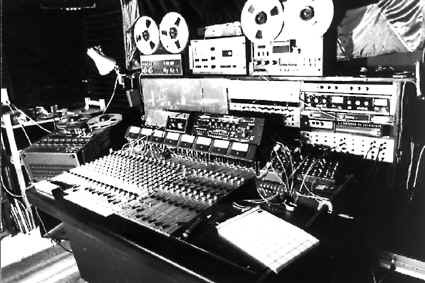 To the left you can see, how the studio looked in 1978, as it was located at Landskronagade and had become a "major" 8 track studio. In my catalog are many publications available only here. Karma Music are publishing music that stores do not have on the shelves. I collect the old Danish rock music and Irepublish old forgotten things if they are worth listening to - and that's the lot. Many new old stuff is coming, so drop by Karma Music. This is where it snows . My store sells a special committee of CDs that I and many others love. This selection represents both a taste and a time . It's called a niche that I do a lot of. There are so much great music that does not exist in the so-called record stores and that is where Karma Music enter the picture. Our prices are reasonable. So low that you can aford them, and so high that we, too, are here next year. I hope you're enjoying the site. Is there anything you think is missing or something you would like to comment on you are most welcome to it. Click karma@karma.dk and go ahead !